Well, today has proven to be another eventful day at the McQueary home! I am raising a bunch of little artists! First, Nadine has brought home her first preschool art! And let me tell you she is very proud! She has painted clouds on this one and made little blue and green fingerprints on the other. I believe my fridge is gonna be full! So onto the little man - who believes that because it's white - it must need color!!!! Rowan took a marker from Jourdyn's room today and colored my wall! I heard it marking the wall while I was in the kitchen - and I just knew what he was doing. I turn ed the corner and he was telling me "Marker Marker" - and I said, "YEP, that's a marker!" I told him that was bad - you only color on paper. So he proceeded to say "Daddy, daddy, uh oh!!! uh oh!" Pointing at it like it wasn't him that did it! He's already learning to be a tattle-tale! Needless to say - they were washable! And if you don't know who Matisse is - if you have ever been to the Toledo Art Museum - when you go in the back entrances walk past the stairs like you are going to the elevators - there is a huge wall art made of tiles - that is Matisse!!!! If you don't know who Van Gogh is - go back to school and pay attention this time! My dad stopped by and we decided to take the kids to Maumee Bay at dusk to see the deer. We saw the funniest thing. If I had had a video camera - I could have won Animal Planets Funniest Animal video show. Right next to the parking lot there were 3 doe. About 10 feet from one of them was an animal of some sort. We weren't sure what it was until this happened. But as the deer (who was just as inquisitive) decided to smell the animal - the cat jumped back about 10 feet. The deer was startled and began a staring game with the cat. The cat laid in its best preying lion stance and the deer stood in what can only be described as a full point. They stared each other down for about a minute and the deer decided to make a move. She stepped forward two or three steps and the cat again jumped back. They continued this little dance for several minutes. Until the point that the deer had the cat back up to a tree. They then began to peak around the tree at each other. A very intricate dance! The deer again stepped in towards the cat- who then cheated and ran up the tree. The deer was kinda baffled. She looked up and the cat and literally shook her head. She gave up and walk away with her friends. It was quite a show! Mind you, all this was going on as my children were in the car with all windows down, laughing and screaming at the funny animals. We were no more than 20 feet from the whole thing and the animals were so busy with each other, they didn't even care about all the noise. Nadine says that they were playing tag. And Rowan was just excited to see dogs. Just about everything with 4 legs are dogs. However, he does know cat. I think he was more amused with the big animal and didn't even pay attention to the little one. Jourdyn was also amazed that they were playing together. Yesterday, I sent Rob to the store to buy lemonade and iced tea and he comes home with this. 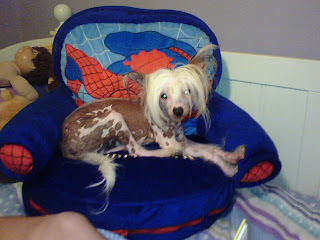 Not the dog - that's Mia, my Chinese Crested! I know - she's ugly - I don't need to hear it again! I happen to think she is beautiful and the bonus is she's a little lap dog that doesn't bark! So he came home with the Spiderman chair for Rowan. (It is also a bed!) Rowan loves it just as much as Mia. In fact, they have fought over it a couple of times. This is all funny because when I was pregnant with Rowan, Rob's dad, Jack, passed away unexpectedly. Jack loved Spiderman. So Rob likes to get Rowan Spiderman things as a way for him to know about his Grandpa. It's very sweet and special! So the funny part is that whenever Maryann (my mother-in-law) sent Jack to the store for something minor like iced tea and lemonade - he always came home with whatever she needed and ice cream and bananas!!! Rob does the same thing just usually some kind of toy or special treat for the kids. Like father, like son! Speaking of yesterday, our care group, MOD Squad started meeting at our home for our Sunday night Bible study. This session we are doing Rick Warren's 40 Days of Community. It was nice we had 11 people and two of those were new attendees. Rob and I feel so blessed to have our new home here in Oregon. (New to us!) It is truly a gift from God and we want so desperately to give back to Him in any way we can. Opening our home to our friends (actually our family!) is the least we can do. And it is such a blessing to do so. I did have to finish the first coat of my livingroom wall paint yesterday before everyone came. I had about a week and a half ago started painting and stopped in the middle (that's what happens with 3 kids, 2 dogs, a rabbit and a husband) So this gave me a reason to commit and get it done! I still have one coat to go but I'll get to it eventually! It just looked kinda funny with one wall half tan and the other half white. Today was Jourdyn's Bike-a-thon for school. I volunteered to be a "trail rider." I thought no big deal I have usually rode with her in the past years - I can do this. Well, I must say with an extra 30 pounds on the back of the bike it was quite a task. Nadine went to the zoo with Grandpa today. However, Rowan was with me (the extra 30 lbs.) Together, he and I biked 3 miles for the first lap. I was exhausted. I left and did some errands. When I returned to pick up Jourdyn, I found out she rode a total of 27 miles. Go Jourdyn!!!!! Ah, to be young again!! Sorry - no pics today! I didn't have my camera with me. Hello one and all! I have so many friends and family out of state (or country)! I have started another blog for my Women's Ministries service at Oregon Nazarene Church (www.oncwomensministries.blogspot.com) and I have found that I actually like it! What a wonderful way to communicate with distant friends and share pictures. So it is with this thought that I begin this journey. Today, is Sept. 18 (as you see above) and it happens to be Nadine's first day of preschool. She is 3 1/2. She has been so excited about this. We were, of course, unable to find her the Dora backpack, she so desperately wanted. But we settled on this one! She will be going twice a week for a couple of hours each time. Which will be a great time for me to get some stuff done. Rowan is in the next picture with her. He is 18 months now. One more thing - I do not beat my chidren - the mosquitos are absolutely terrible this year. Nadine woke up yesterday with a big welt on her left eye. She not only gets the bite bump - but those little bumps swell - she is allergic to mosquitos. Today it looks much better. But I just had to make that disclaimer.